My mini apple trees branches are badly leaning down some are practically growing sideways now it only has a few main branches and i don't know how to correct it it looks a mess. Do i tie them up for now or chop them right back. Or do i have to wait it out til winter then chop them back. I cant attatch photo as they say file to large on my phone when i try. They basically make a right angle with the main branch thats how much they are leaning down. 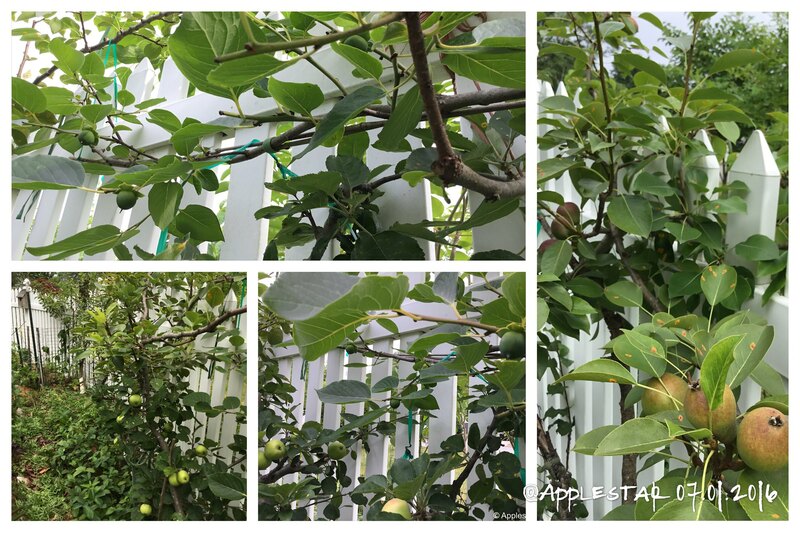 Re: Mini apple tree branches leaning bad! An image would be a lot of help, as i can't really imagine what you're trying to explain. Could you resize the image and try again? The best way to prune fruit trees is in a cone shape, meaning that the branches have to be at a 45 degree angle or more. Very few of your branches are like that. What I'd recommend is leave the longest, highest branch in the 2nd and 3rd image and then prune the rest of the braches half way in the winter. Hopefully, they will grow back higher in the spring. Can I not prune them now or is that a bad idea. They seem to be growing bigger and progressively leaning more over the months. Is there any way to encourage that they grow up after pruning. horizontal branches can be good for fruit-bearing. is there a particular reason that you want a lot of vertical growth? if it's supposed to stay a 'mini' tree, it may have been selected to not really grow that way (or have a rootstock that helps keep it that way). Get a small stake and put beside your tree. Tie the longest of those bunches to it....this would give your tree a centre leader. The branches that are coming out horizontal will form a framework for your tree. In the winter the leader can then be tipped back to force more side shoots to grow. The side shoots that are already there can be tipped back to make a solid base frame for cropping. I just think it looks wrong thats why i want them more upwards ill tie the leader to a stake and in winter ill chop the leader back a little and all the other branches by half and see how it goes. The reason why i like training my fruit trees in a cone-shape is beacuse it is more compact and looks more organized and neat. In my opinion, cone shaped would be best for you, as from what I see in the image, your tree is in a corner. The branches growing horizontally could break against the wall corners. I suppose you could let the branches away from the walls grow horizontally, but the ones in the corner grow in a cone-shape. The reason for actually TRAINING the branches to grow horizontally as JONA alluded to, is because the way plant hormones work, the tree will start "cropping" -- i.e. Fruiting -- at an earlier age and produce more, too. It also makes it much easier to harvest from lower hanging branches. My semi-standard Enterprise is trained that way -- sometimes it's better to bend the branch over than to cut. I noticed that this tree is rather close to the walls as well -- does that mean there is limited amount of sunlight? I was wondering why there is a sofa next to it....? Assuming this is a good location for growing the apple tree, you might look into pruning and training the tree as an espalier. You would provide wire and cane supports for the branches so they can grow longer without sagging. This will enable restricting the tree's growth and size to fit a compact space.